The ‘Beast from the East’ has hit Italy too. It’s not just the UK that has been hit by the ‘Beast from the East’ and is experiencing vast amounts of snow. 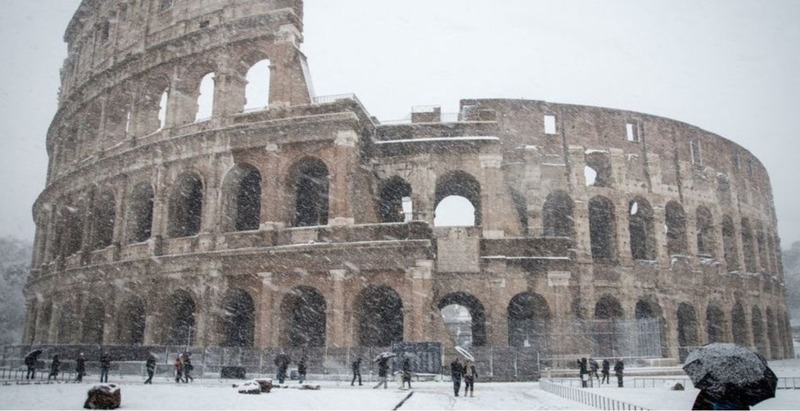 The Italian capital city of Rome, which is typically associated with Mediterranean sunshine, was hit by a rare snowstorm on Monday leaving the ancient city covered in a beautiful white blanket. According to The Local, this is the first patch of snow to arrive in Rome in six years. The snow – which has also hit the UK, France, Germany and Greece – is a result of very cold air from Russia making its way over to Western Europe, which has led the snowstorm to be dubbed the ‘beast from the east’. 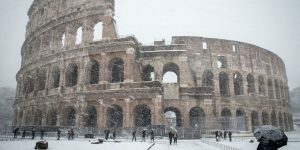 Arguably, the snow left iconic landmarks in Rome such as the Colosseum, Spanish Steps and Trevi Fountain looking even more breathtaking than usual as they were covered in the white sheet of snow on Monday morning. While the city’s transport system ground to a halt and schools were closed, residents were spotted skiing, sledding and building snowmen as they enjoyed the rare weather in their home city. The UK Met Office said on Sunday that the week ahead looks set to be the coldest in the UK for a number of years. Much of London and the south east were hit with snow on Monday morning. It is expected snow will arrive in the midlands, the east of England, Scotland, Northern Ireland and Wales over the next few days. For the man of distinction. Make Penelope Cruz your hair accessories muse.